Showing off more pinks for Beverly's pink group again this weekend. Spring has started down here and I for one couldn't be happier!! I love the warm sunshine and the few plants sprouting up here and there. The photo below shows the blooms of a peach tree down the street. Simply stunning! Last Saturday was this little one's first birthday. She's so grown up already! My sister made her birthday cake and I did the banner and her dress for her. The weather was perfect so everyone had fun outside. A perfect first birthday party!! Hope y'all all have a great pink weekend! I visited Dru last weekend at Garden of Dreams and enjoyed her tulips and tags!! 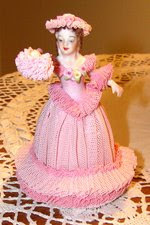 Stop by How Sweet the Sound and visit her and some other pink blogs! She is adorable! Love that dress! Oh and I just noticed you mentioned me in your post - thank you so much! Happy Pink Saturday to you!! How cute is that. Looks like she was having a ball at her great party. Oh what a beautiful share. I love this little blossom, Avery. Is she not the sweetest thing with her little leopard pink and black outfit on? Oh my gosh, I love her headband and bow. Her little pink nose. How sweet. The banner is just darling. Who made that? They did an awesome job. And her cake, has a little guitar. I love it. Yes for her First birthday I would say that "Avery Rocks, yes Indeed". So priceless are these photos. Thank you for the beautiful share today. You have so made me smile. I can hear the laughter amongst you all at this party. Love this post, she is a cutie! What a cutie pie. And how thoughtful of her to wear pink. It suits her to a tee. Lovely flowers, it is nice to see flowers! It is snowing up here in New England. These photos are so cute! !Really like your blog. Glad I found it!! How gorgeous! Love the birthday banner.